Shift the Pie Five model to help our operators adapt to today’s restaurant environment. By giving franchisees better control over variables, we’re putting them in the best possible position for success and offering a shorter, straighter path to profitability and growth. Restaurant operators have long talked about the Goldilocks zone, where sales align with occupancy costs and labor—along with the cost of goods and other factors—to create the best possible returns. We started with this idea and reverse engineered the Pie Five model to make our offerings more attractive to guests and more efficient for operators. We call it the Goldilocks Initiative. We think you’ll like the results. It’s about making Pie Five more appealing to more guests, but also about adjusting every factor of operations to increase demand and efficiency. The finished product is a model that puts less money in the pockets of suppliers and landlords and more into the profits of our owners. The industry has recognized our hard work, earning us the fastest growing, leading position in our category. What makes Pie Five Pizza franchisees so successful isn’t just our amazing pies. It’s also our proven business approach. 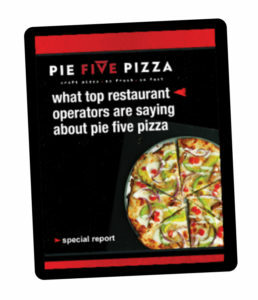 Read for yourself what some of the top restaurant operators have to say about Pie Five Pizza.